This post by Lauren Mobertz appeared first onitsgoodthis. As his month-long “residency” in New York begins to end, elusive street artist Banksy has made a conscientious move to help a New York charity in a big way. 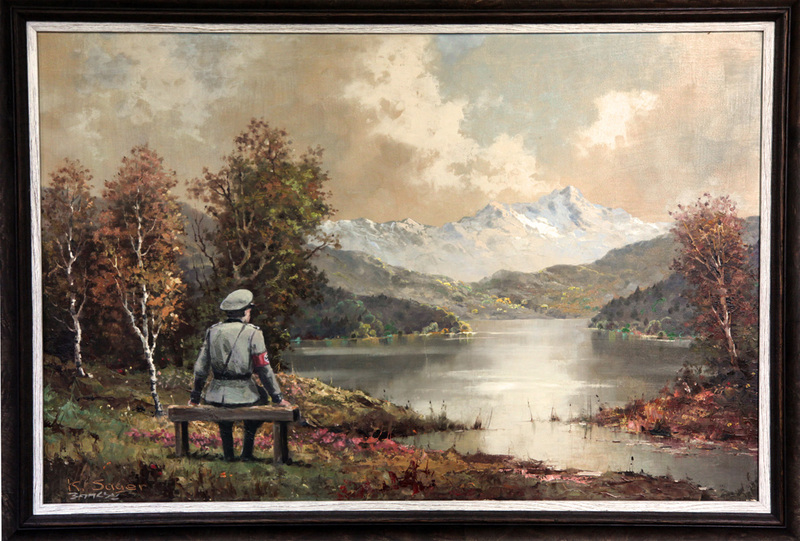 Yesterday Banksy posted a picture of The Banality of the Banality of Evil to his website, featuring a portrait of a Nazi soldier painted onto an oil painting hanging in the Housing Works thrift store on 23rd Street in Manhattan. If Banksy were going to donate a painting to any New York charity, Housing Works is one of the most deserving ones he could have chosen; Housing Works fights the dual causes of HIV/AIDS and homelessness in New York and takes in additional funds through thrift stores throughout Manhattan along with a popular bookstore cafe. Not only is the painting creating a huge amount of publicity for the charity, but it’s also turning out to be quite a large monetary donation as well. The painting went up for auction last night with the current bid at $211,311 as of the time of this writing, according to Bidding for Good. Below is a picture of the painting hanging in a Housing Works thrift store along with the crowds gathering to see the work.